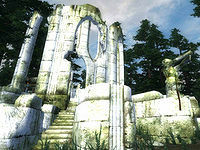 Ceyatatar is a medium-sized Ayleid ruin between the Imperial City and Skingrad containing conjurers. 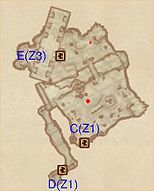 It contains three zones: Ceyatatar, Ceyatatar Gorigarlas, and Ceyatatar Gorihame. To the southwest of Ceyatatar in the Great Forest is a trapdoor (view on map) with a minor loot chest next to it. The trapdoor is labeled Trap Door to Ceyatatar Gorihame. This is actually a back entrance to Ceyatatar Gorihame (Out on the Zone 3 map below). Until you've worked your way through from the front door, it only gives access to a small tunnel. From here you can access one of Ceyatatar's boss-level Ayleid Casks chests and a restoration Ayleid Chest. If you have passed through the ruins and opened the rock pillar door using the push block, you will find the entrance closed upon subsequent visits through the trap door. This is a glitch that can be circumvented by loading the autosave or saving in place and reloading. Ceyatatar is described in the book Glories and Laments, according to which Ceyatatar translates into "Shadow of the Fatherwoods". However, the Ceyatatar described in Glories and Laments bears little resemblance to the Ceyatatar that you actually explore. According to The Song of Pelinal, v 3, Ceyatatar was the site of a duel between Hadhuul the Fire King and Pelinal Whitestrake. Like many others it ended in victory for the Divine Crusader. Ceyatatar also appears in ESO. 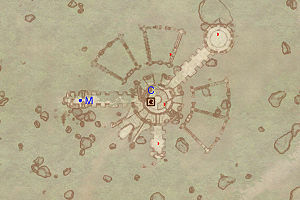 This location's map marker (M on map) is named Ceyatatar (editor name CeyatatarMapMarker). The entrance door is E of the marker, 100 feet away. You will enter this zone at the entrance (Out) and work your way through to door C to reach the remainder of the dungeon. 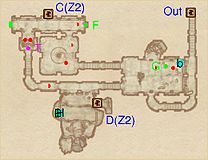 The only notable obstacle along the way (besides the usual enemies) is the cave-in trap at T, which can be avoided by using the other (northern) corridor to get from the main room to the exit. 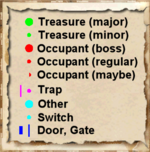 The southernmost room in this area, containing a waterfall, boss-level Ayleid Cask (B), and dead treasure hunter (H) can only be accessed using the (underwater) door at D from Ceyatatar Gorigarlas. The unreachable upper part of the waterfall contains nothing of value. You enter this small zone through door C, and door E provides access to the third and final zone of Ceyatatar. In the middle of this area is a water-filled trench. At the western end of the trench is a tunnel that leads to a previously unreachable area in the first zone (D); it requires swimming underwater, but can be done without Water Breathing abilities. This gives you access to a small room with a waterfall, containing a boss-level Ayleid Cask and dead treasure hunter. You enter this zone through door E (unless you stumbled upon the trapdoor prematurely, in which case you enter through the exit at Out and only have access to one small corridor; see notes). To exit through the trapdoor at Out you will have to open the hidden door at I using the adjacent "Press Block" (cyan dot). This zone contains three prisoner cells, all of which are locked. The turn handles outside of the cells do not open the doors; they only release poison gas (traps T) into the captives' cells. Opening the cell gates at H and K may be worthwhile for the Dead Captive and Ayleid Coffer, respectively. However, gate J does not provide access to any items. 3 Gas traps at locations T on map. These traps are only activated if you turn the turn handles (cyan dots) outside the gates.